Built by Avions Voisin, a great small company blessed with unique vision, innovative solutions and extreme nonconformism. Unfortunately, these blessings were not enought to make it into a really successful business. Particularly hard hit by the financial crisis of the early 1930s were luxury manufacturers like Voisin; many of the company's loyal customers simply could no longer afford to indulge*. As unconventional as the cars he produced, Gabriel Voisin's solution to the quickly dwindling sales was at best counter-intuitive. Instead of switching to simpler models and broaden the potential customer base, he stepped up and developed some of his most advanced models yet. Dubbed the C25 Aérodyne, the first of this new three-model range was previewed at the 1934 Paris Auto Salon Using a modified version of the earlier C24 chassis as a basis, this prototype mainly served as the preview of Voisin's new design direction, while a brand new radial engine was developed. For the first time in many years Gabriel Voisin had been solely responsible for the lines, following the split with designer/artist Andre 'Noël-Noël' Telmont. Although some of the familiar Voisin cues were retained the aptly named Aérodyne design was considerably smoother and aerodynamic. Especially the nose of the new four-door saloon, with the struts supporting the lightweight fenders, was still vintage Voisin. It is the 'fastback' rear that set the Aérodyne apart from the previous designs. This sported a completely integrated trunk, which allowed for the car's most striking feature; the sliding roof. Powered by two vacuum pumps fitted in the trunk, the ingenious system allowed the entire roof to slide back. To maintain rearward visibility the roof was equipped with several 'portholes' that lined up with the rear window. Voisin had planned to equip the production version of the C25 with a brand new 7-cylinder radial engine but tests early in 1935 yielded disappointing results, so he was forced to revert back to the tried and tested sleeve-valve engine. Built under a Knight patent, Voisin's latest version was a straight six with a displacement of just under three litres. Equipped with two Zenith carburettors the very quiet unit produced around 90 bhp. It was mated to a two-speed electromechanical gearbox with overdrive on both gears, effectively giving the car four forward gears. The pressed steel ladder chassis was also very similar to those used for the earlier Voisin models. One difference was the boxed rear section, which served to support the integrated trunk and rear fenders. Both the front and rear suspension were equipped with adjustable shock absorbers. These could be tweaked by two large dials on the very busy dashboard. Packed with dials and switches, the dashboard design and layout was still very much a remnant of Gabriel Voisin's years as an airplane manufacturer. Also typical for Voisins were the art deco prints used for the upholstery. Code-named 'Bob', the C25 chassis was available with a choice of coachwork, with the 'Aérodyne' topping the range. At its original Paris launch, the futuristic four-door sedan had wowed the crowd and received universal acclaim. Unfortunately, this admiration for Voisin's latest design was not converted into many sales. A big problem was the price; at over 70,000 Francs, the C25 was considerably more expensive for example than a comparable Bugatti Type 57. Production lasted until early 1937 by which time only 28 examples were built, seven of which were Aérodynes. Soon after its launch the C25 was joined by a longer wheelbase C26 and the similar but larger engined C27 and C28. Built in very small numbers, these represent some of the finest cars by Voisin but, ironically, like so many other manufacturers of the day, Gabriel Voisin reached his creative peak at a time when there was little to no demand for these spectacular vehicles. Despite some desperate attempts to restructure and refinance the company, Voisin eventually had to file for bankruptcy late in the decade. Today only a handful of these fabulous machines remain because they were difficult to maintain and constructed from metals that proved very valuable during the War. With so few cars remaining, Voisins are a rare sight today and often overshadowed at events by contemporaries like Talbot Lago and Bugatti. That was certainly not the case at the 2011 Pebble Beach Concours d'Elegance when a beautifully restored C25 Aérodyne was awarded 'Best of Show'. Chassis 50010 was one of just seven Aërodynes (including the prototype) produced. 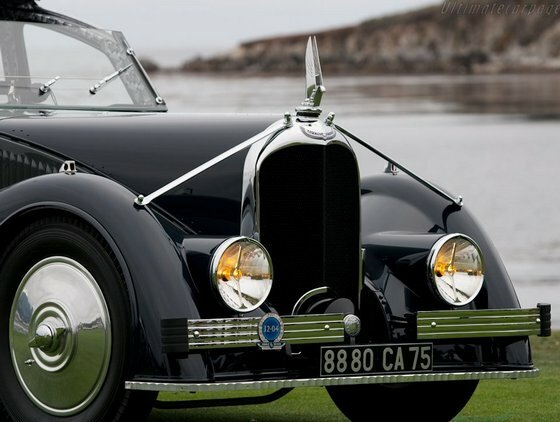 It was first seen at the 1935 Lyon Concours d'Elegance and eventually disappeared. Many decades later it was discovered near Monaco, complete but in rather derelict condition. The current owner acquired the car in around 2004 and has since subjected it to a meticulous restoration that lasted close to three years. The C25 Aérodyne made its glorious post-restoration debut at the 2011 Pebble Beach Concours d'Elegance, claiming the much coveted 'Best of Show' award. It will soon be on display in the Mullin Automotive Museum just north of Los Angeles. Silent film heart throb Rudolph Valentino had some model of Voisin. You can also be proud of M. Voisin - a great French engineer, aviator, mecenate, artist and a kind of Dieselpunk Casanova. i'm proud such a beautiful car was french !